DJ Neil Armstrong DL 2 Original The followup to Original . More Hip Hop, more original samples. Turntablism throughout. AVAILABLE NOW AS A DIGITAL DOWNLOAD – $6.50, immediate secure download. Complete Mix in Mp3 Format, tracked out and sent as a Zip File. The followup to Original . More Hip Hop, more original samples. Turntablism throughout. AVAILABLE NOW AS A DIGITAL DOWNLOAD – $6.50, immediate secure download. Complete Mix in Mp3 Format, tracked out and sent as a Zip File. Original. The Mix that started everything off. Going back and forth between the Original Sample and the Hip Hop songs that used them. Incorporating a lot of my turntablist roots this is part showcase,part learning experience, part musical journey. “I was at this bar called Dreamland because I was stuck in New Mexico after my flight from the Bay Area was delayed. For some reason “Tootie” from the “Fact of Life” was there. 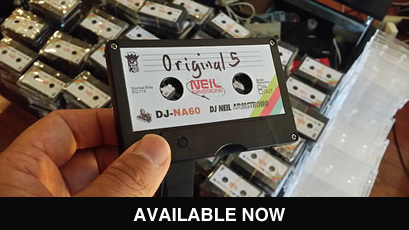 I looked around, and they had turntables set up, I had my crate of records, my ‘originals’ set, and nothing but time on my hands… What is recorded here is what happened that night…”” – DJ Neil Armstrong A complete LIVE mix , No do-overs, no over dubs, straight skills. The next chapter in the Original Mixtape Series, and also the Final Chapter in the All Out King Mixtape Series - AOK Part 6. This one is for the fans who have been listening to my mixes for the last 10 years, and with this one I'm bringing it full circle. You should know the deal. Original Samples, mixed with their Hip Hop counterparts. Crossing genres, drawing that connecting line between rock, soul, reggae, opera, classical, blues, funk, jazz... let's just call it good music. All mixed with that Hip Hop aesthetic, and all samples used were on original vinyl, to show love for the lost artform of diggin'. Listen to the complete mix below for freezy. Try before you buy. The Next chapter in the Original Series, we now present to you original5. Exploring the musical DNA of the songs we love, by connecting the original samples that were used to make the music. Mixed with that Neil Armstrong aesthetic you have come to expect. Originally released on USB Cassette. AVAILABLE NOW AS A DIGITAL DOWNLOAD – $8.00, immediate secure download. Complete Mix in Mp3 Format, tracked out and sent as a Zip File.